After her time with the FAP, while her husband was serving overseas during World War II, Wayne moved to California. She began taking classes at Cal Tech University, learning to read and produce technical engineering drawings and blueprints. A combination of this training, her dissatisfaction with the materials and production of painting, a new comfort with self-identifying as an artist, and a lifelong fascination with optics led Wayne to explore printmaking. Wayne’s first experiments with lithography were serendipitous: her neighbor, Lynton Kistler, owned and operated a lithography studio. By the mid-1950s, Wayne had turned almost exclusively to lithography, which she used to explore abstract representations of light, space, and perspective. In 1960, Wayne established the Tamarind Lithography Workshop in Los Angeles. Dedicated to cultivating printmaking in America, and sustained by funds from the Ford Foundation, Tamarind offered paid fellowships to artists interested in lithography. Artists such as Ruth Asawa, Anni Albers, Gego, and Louise Nevelson came to study what was then considered a dying medium in America. 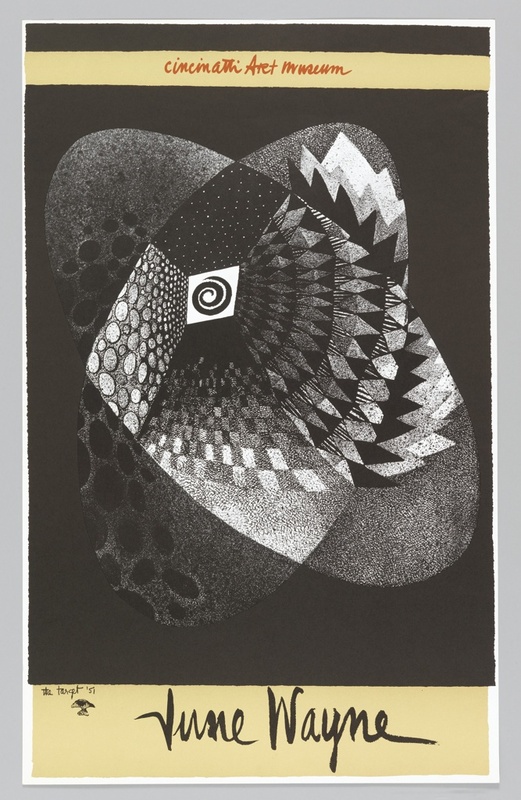 Wayne resigned as Director in 1970, when Tamarind was reestablished in Albuquerque as part of the University of New Mexico, but continued to work with lithography and to find ways to champion fellow artists. The legacy of her work includes influential experimentations in symbolism, surrealism, abstract figuration, and visual manifestations of feminist political theory, as well as a legacy of extraordinary advocacy for printmaking in the United States. In an oral history conducted for the Archives of American Art, Smithsonian Institution in 1965, Wayne claims she cannot recall how she was admitted into the program. However, she had exhibited her paintings in a solo exhibition at the Palacio de Bellas Artes in Mexico City in 1936. She goes on to say that this government initiative, “gave a sense of identity, however fragmentary, to artists who till that time really could not find a slot for themselves within society.” See note 2, above. Though Wayne spent enormous periods of time painting earlier in her life, she would later came to believe that “oil on canvas is a basically idiotic combination.” See note 2, above.